Symphonic Eternity | OK Listen! 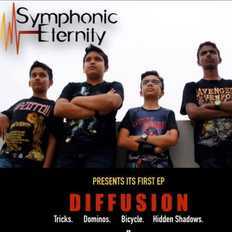 Symphonic Eternity is a band comprising students of Octavium’s Music Academy. Their music is progressive rock/metal and they compose and play their own songs, with the occasional cover for their sound checks during live performances. ‘Metal Dragons’ as their name for Octavium’s 1st Anniversary Celebrations in April 2014.
in August that year, as ‘Diffusion’. It soon became apparent that the band was making & playing music well beyond the ages of the band members. Chennai’s ‘Saarang’, IIM Bangalore’s Unmaad, Vodafone’s Bangalore Bicycling Marathon 2015, Bangalore Open Air, Central’s Battle of Bands, and a few other gigs.! Rohan started his musical journey, seven years ago as a five year old, learning to play the guitar. He continues his learning under the tutelage of Bruce Lee Mani. Rohan has written all the songs that the band plays. Rohan’s favourites are Lamb of God, As I lay Dying, Children of Bodom, Bullet For My Valentine & Metallica. His guitar heroes are Steve Vai, Joe Satrian, Nick Hipa, Phil Sgrosso, Mark Norton & Willie Adler. Led Zeppelin, Deep Purple, Black Sabbath & Judas Priest. Marty Friedman, Mark Morton, Ritchie Blackmore, Steve Vai, Yngwie Malmsteen are his guitar idols. Vijay learns contemporary guitar from Himanshu Gautam at Octavium’s Academy. He is also a student of Carnatic Vocals and has learned to play the keyboard as well. He loves the sound of the electric bass and has chosen it as his instrument for the band. Avenged Sevenfold, Lamb of God, As I Lay Dying, System of a Down, Sinister Gates, Kurt Kobain, Randy Rhodes, Dave Mustaine are Vijay’s musical favourites. Anagh started learning the keyboard at home when he was eight years old. He moved to the piano at Octavium’s Academy a little over two years ago and then made the switch to drums some months after. He learns from Rohit P S.
Anagh’s favourite bands are Porcupine Tree, Metallica, Lamb of God & Dragon Force. His role model is Gavin Harrison and his other drum heroes are Jojo Meyer, Marco Minnemann and his mentor Rohit.